The eye examination has now become even more comfortable! We have invested in the latest eye prerssure measuring instrument that requires no puff of air, or drops. This innovative equipment is completely painless and is based on a rebound measuring principle. Your vision and eye health is extremely important to us. 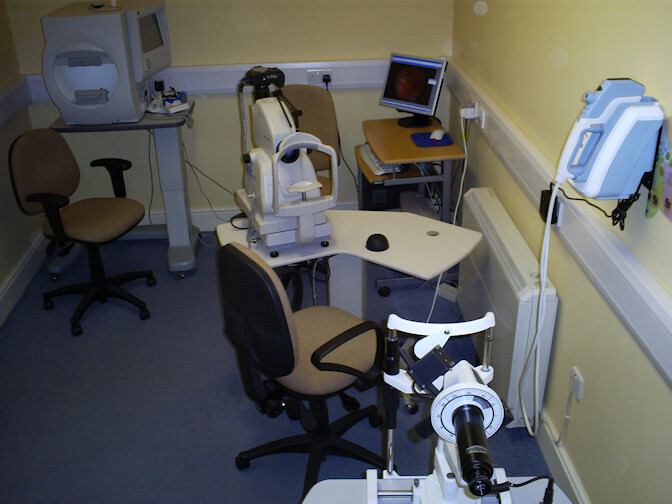 To ensure that you treceive a thorough eye examination we use the very latest optical technology. This can include the latest Swept Source Optical Coherence Tomography (SS-OCT) scans. An extended examination ie recommended for all patients, rather than the more basic NHS Sight Test. OCT is an advanced eye scan for people of all ages. Similar to ultrasound, OCT uses light rather than sound waves to illustrate the different layers of the eye and provides a three dimentional scan of the eye strucures. The scan is non-invasive, painless, simple and quick. The images are saved, together with a digital retinal photograph, for future comparison. Common conditions identified through regular OCT scans are age-related macular degeneration, glaucoma, macular holes and vitreous detachments (see 'eye conditions' page for futher information of these conditions). Booking your eye examination could not be more simple - telephone, call into the Practice or send a message via the 'Contact Us' page of this site. NHS subsidy towards eye care available to some patients, click here for information. We are supporting the Vision Aid Overseas Ethiopia campaign. The prize draw has been made. Please click here for further information. We are committed to providing the best services for all. Click here for information and resources about eye care for adults and children with learning disabilities. If required, we are happy to refer you to a Private Ophthalmologist either locally or in London. Click here for further information.